1814 Unit Ar. Cunobelin. C, 10-40 AD. Obv; Laureate head r CVNOBELINVS around. Rev; Winged horse l CAMV below. VA -, Spink 310. Heavy horn silver surface deposits. 1.20g. Fine. 1813 Unit Ar. Atrebates. Eppillus. C, 10 BC-10 AD. Obv; Romanized head l, IOVIR in field. Rev; Victory r between EP. VA442-1. A little grainy but a rare type. 1.27g. G Fine/NVF. 1815 Unit Ar. Cunobelin. C, 10-40 AD. Obv; Two leaves dividing CVN. Rev; Horseman r, CAM below. VA2047. Obverse a little frosty. 1.27g. Fine/GVF. 1086 Unit Ar. 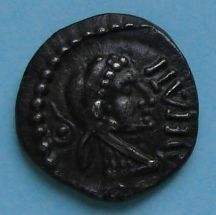 Iceni. 'Boudicca head type'. C,61 AD. Obv; Celticized head right. Rev: Horse right, large wheel ornament above. Van Arsdell 794-1. Crude large face. 1.06g. NVF. 1083 Unit Ar. Atrebates. Tincomarus. 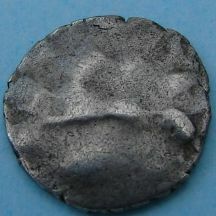 C,30-25 BC. Obv; TINC in angles of cross. Rev: Lion left. Van Arsdell 372-1. Grey tone. 1.29g. Fine/G Fine. 1783 Unit Ar. Atrebates. 'Sussex lyre type'. 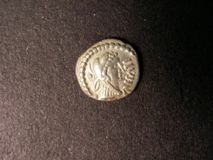 C,70-40 BC. Obv; Celticized head right. Rev: Horse right, lyre below, wheel above. Van Arsdell -. Dark tone, rare. 1.13g. VF. 1790 Unit Ar. Trinovantes. Cunobelin. C,20-43 AD. Obv; Walking hunter right, CVNOBELINVS around. Rev: Standing hunter holding bow, TASCIIOVANI around. Van Arsdell 2063-1. Good metal and detail. 1.31g. GVF. 1793 Unit Ar. Trinovantes. Tasciovanus. 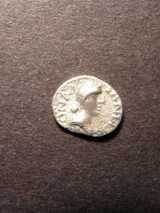 C,15-10 BC. Obv; Laureate head right, TASCIA before. Rev: Bull butting left. Van Arsdell 1794-1. Good silver, scarce. 1.34g. NVF. 1786 Unit Ar. Atrebates. Verica. C,20-25 AD. Obv; Bull right. VERICA above, REX in ex. Rev: Figure standing left, COM MI F around. Van Arsdell 506-1. Good surfaces, nice detail. 1.23g. GVF. 1792 Unit Ar. Trinovantes. Tasciovanus. 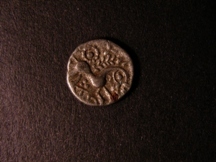 C,15-10 BC. Obv; Eagle standing left, TASCIO around. Rev: Winged griffin right. Van Arsdell 1792-1. Frosty surfaces, scarce. 1.21g. G Fine. 1785 Unit Ar. Atrebates. Verica. C,10-20 AD. Obv; COMF in tablet. Rev: Eagle with wings spread. Van Arsdell 471-1. Good silver. 1.09g. NVF. 1782 Unit Ar. Atrebates. Epaticcus. C,35-43 AD. Obv; Bust right, EPATI before. Rev: Eagle standing on snake. Van Arsdell 580-1. Toned, nice detail. 1.06g. GVF.